Demo & Discussion – For this part of the lesson, students will not handle the bottles, they will answer discussion questions based on their observations only. Share observations about the bottles. What do the bottles have in common? What is different about the bottles? What do you think the original contents of the bottle were? What phases of matter are shown? Are any of these bottles empty? Explain. Do all of these bottles have air in them? Which bottle has more air in it: Cotton Balls or Water? Explain. Which bottle is filled the most? Least? Which bottle has has the most ‘stuff’ in it? Least? Which bottle is the heaviest? Lightest? How would you order these bottles from lightest to heaviest? 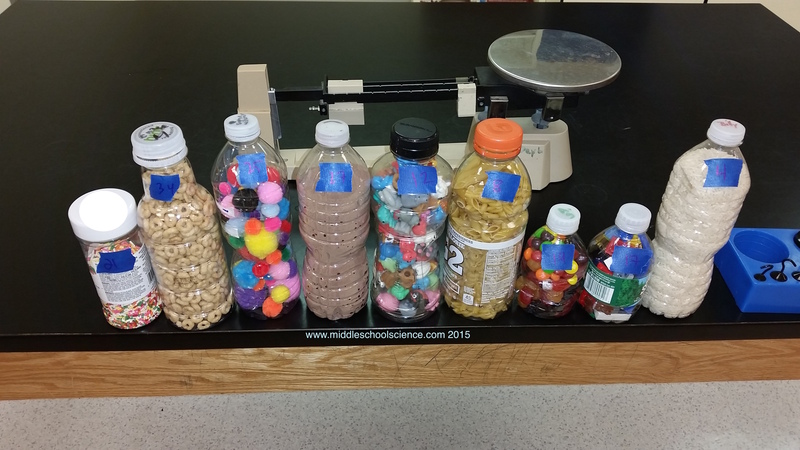 Estimate the mass of each bottle in grams. Which bottle is the densest? How would you arrange these bottles from least to most dense? Which of these bottles can have more of the same ‘stuff’ added to the inside of the bottle? Explain. Each group will have one set of bottles or take turns using the demo bottles and sharing their findings. 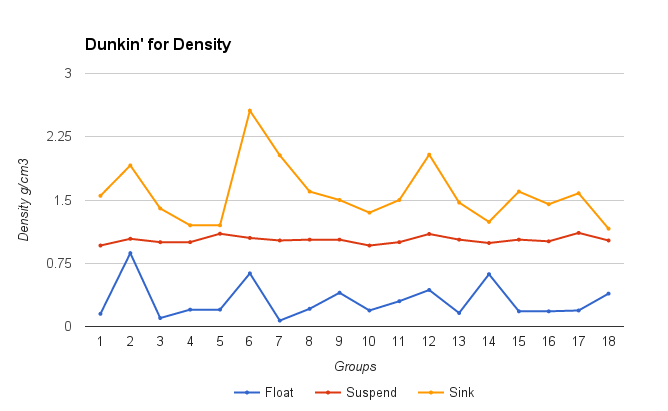 How did your findings compare to your observations and predictions? Dunk tank – time to find out which one will float! Give each group of students a new set of bottles (ones that they have brought in from home) and have them make observations, predictions, and density calculations. Have each student bring in a bottle from home filled with the contents of their choice so that you have enough bottle to compare. Match similar bottle shapes/sizes together for each group or match similar contents in different sized bottles for comparison. You can also use these bottles as part of a Triple Beam Balance Activity (blog entry). Above is a photo of a 4-door foldable for the three density related formulas: D= M/V, V= M/D, and M = VxD. The 4th door has step by step instructions on how to solve a word problem. 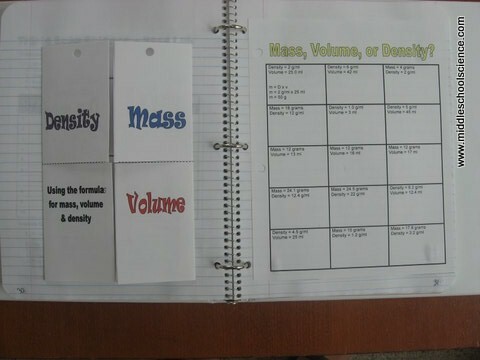 Along with the formulas, inside the foldable are 3 practice problems, and a few notes about mass, volume, and density. On the right side of the notebook are practice problems. Students have to determine which formula is needed, set up the problem, solve, and add the correct units. They can refer to their foldable for the formula and how to solve the problems. I have the students close the flaps for the known values. For example, if the problem states the Density and Volume values, they close those doors on the foldable leaving the Mass flap open, since it is the missing value. That is formula they will then use to set up the problem correctly and solve. My main goal for this lesson is having the students choose the right formula, set up the formula by plugging in the known values (this is a step that the kids don’t feel the need to do/show as part of their work), and adding the correct units when done. Some students may have a little difficulty with multiplying or dividing decimals and rounding to the 100ths place, so I usually go over that before we begin by modeling a few problems with them.